Put down the highlighter and get naturally glowing skin that starts within. To get truly glowing skin, we want to look at a few things. First, you want your skin cells to have adequate hydration and structure. Then, you want to protect against free-radical and sun damage. Finally, you want a nice, even, calm skin tone with adequate protection against inflammation. If this all sounds like a lot to manage, fear not! Combining these key nutrients will do all the work for you. 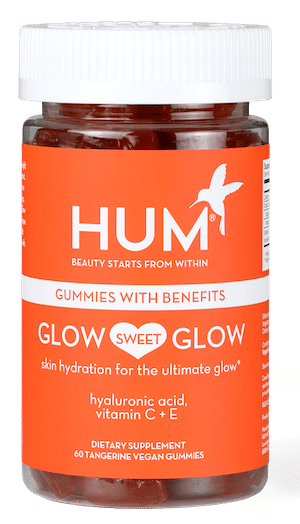 Luckily, to make things super simple, you can get a delicious daily serving of all four in HUM’s tasty vegan Glow Sweet Glow gummy. With a creamsicle-like flavor, glow-worthy nutrition has never been more fun. Hyaluronic acid is an incredibly potent humectant, which means it locks in moisture to give skin extra bounce. While applying it topically helps the surface layers of your skin, for a glow that starts within, you’ll want to increase your hyaluronic acid from the inside out. However, the tricky part is that hyaluronic acid is hard to find. Bone broth is a good, natural food source. 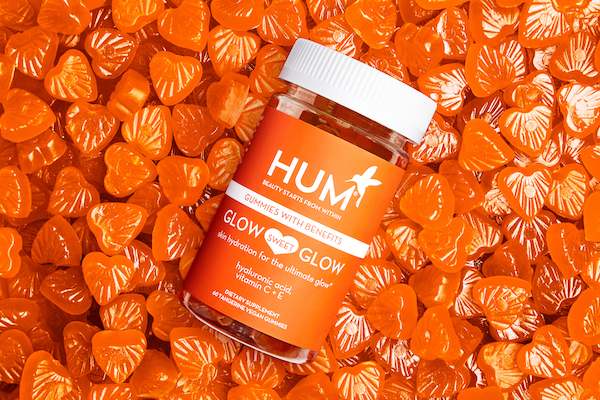 Fortunately, you can also supplement with vegan varieties such as our tasty Glow Sweet Glow gummy. Vitamin C does many wonderful things for the skin. First, it promotes collagen production. Collagen is essential for giving skin the structure it needs beneath the surface. Also, studies recommend increasing vitamin-C intake for adequate protection against UV light. You can get the most concentrated servings of vitamin C in guava, black currant, red peppers, kiwis, and oranges. Vitamin E is a fat-soluble antioxidant that’s been trusted by dermatologists for over 50 years. It’s synthesized by plants, so you’ll have to get it in your diet to absorb the benefits. Finally, vitamin E is rich in antioxidants for anti-aging support and also helps promote healthy, even skin tone. To get more vitamin E in your diet, incorporate almonds, pumpkin seeds, Swiss chard, and mustard greens. Also known as Indian gooseberry, this fruit is well regarded as a superfood in the Ayurvedic tradition. Furthermore, amla fruit is rich in vitamin C, phytochemicals, and antioxidants to fight off free radicals and signs of aging. Ready to get glowing skin? Check out Glow Sweet Glow to learn more.